Every outing needs an Oasis. Just like your adventures, refreshment is better when it's shared. Our 128 oz Oasis lets you bring more than enough fuel for your entire crew. 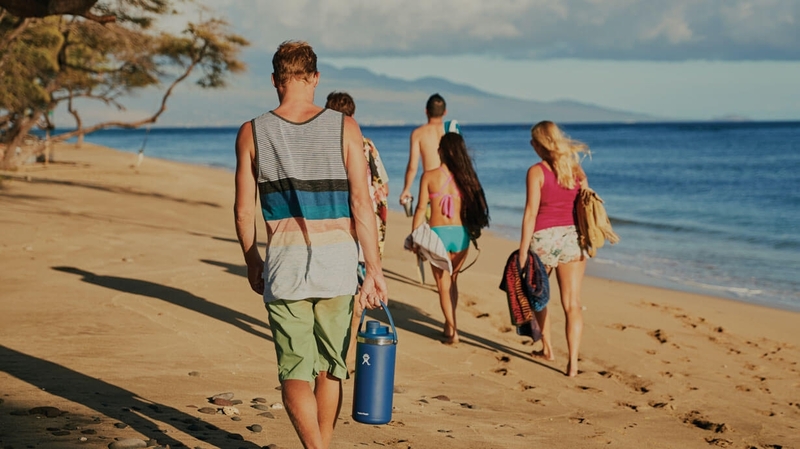 Featuring TempShield ™ double wall vacuum insulation to ensure your beverage stays cold for 24 hours or hot for 12, whether you're at the campsite, beach, or the neighborhood playground. Featuring two leakproof openings: a smaller option allows easy pouring while the larger opening allows easy filling and cleaning. Curved base designed for easy handling and pouring. Take enough to share. 128 oz Oasis is rated 4.4 out of 5 by 8. Rated 5 out of 5 by Doctor Dirt from Sturdy, holds ice well So far so good. Rugged construction, holds ice well even the desert where I live, I expect I will love this flask. Rated 5 out of 5 by Timm from Amazing! I've had my 1 gallon Hydro Flask for about 5 months now and I absolutely LOVE it! I try to drink a gallon of water a day so it's the perfect size for me! Plenty of room for all my stickers! It keeps my water cold all day, even on the jobsite in direct sunlight. I've dropped it many times, and it has held up without any issues. It does weigh quite a bit when full, but everyone needs a little workout everyday! Totally in love with this hydro flask! Will definitely purchase another. Rated 5 out of 5 by jones from Amazing!! Absolutely love my oasis! Was much bigger than I expected and it performs very well. Rated 4 out of 5 by Nikki234 from Keeps hot coco warm! I bought this about a month ago and i love it so much! Rated 4 out of 5 by KendraH from Great for Construction Workers This is a great new addition to the hydro flask family. Bought this for my husband who works construction and he absolutely loves it! His water stays cold for days on end and even keeps the ice solid! The one negative factor of the giant water bottle is the cap and lid choice. It’s sort of heavy duty to try and lift the entire flask above your head to drink out of it, so hopefully we see the straw lid become available in a size for the 128 oz!! Overall, one of the best investments for hardworkers who are based mostly outside. Rated 2 out of 5 by solat152 from Leaks I bought from REI. Returned it. It leaks when on its side. It leaks when drinking water. The straw cap is not compatible with the Oasis unit. Does this have the same carbonation seal/cap as the growler? No, the cap on the beer growlers are what allow the product to stay carbonated.